In Workout Week posts I will tell you everything about my last week’s workouts. On Monday I had my regular 30 minute walk with my dog and in the evening did 1 hour of cycling. Another pain free day, I was very happy about that. Tuesday was official rest day, so I went on a nice long walk with my dog. The weather was hot and sunny, a real heatwave. I felt weird and weak. Wednesday was regular Zumba day. I have to tell you, I have never felt to passive and weak in during a workout ever. My legs just didn’t move! I started falling into ketosis that day so the weakness was normal. No glycogen, no carbs – body feels weeks. When ketones seriously kick in, it gets better. Besides that I did my regular 30 minute walk and got soaked in rain. In the evening I did a short 15 minute walk aswell. Those exercizes really tired me out. It means they worked 🙂 Yay! Friday afternoon I did my regular walk. After dinner I had a long debate with myself whether I should go for a run or go cycling. I had had no sciatic pain for the whole entire week. But I was in ketosis so I felt a little bit tired and weak. I decided to go and run since I really love runninga lot more than cycling. I created a new 7K lap and it was great! No pain, pure joy. Saturday was rest day. The weather was lovely and I had a nice long walk with my dog. Sunday was AWESOME! My macros were a little bad (had some currants and beans so about 15 grams extra carbs that day) but those extra carbs really kicked into my run! 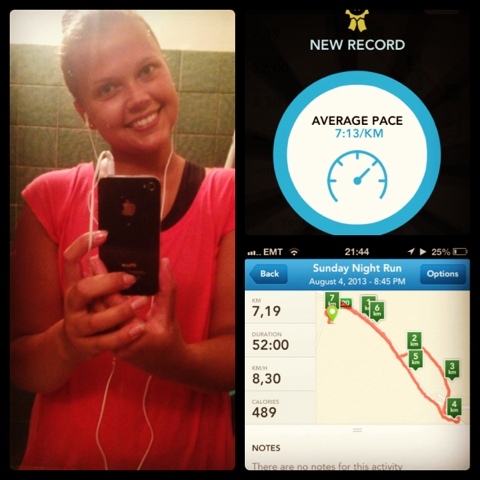 I got my best average speed (8,3 km/h, previously 7,99 km/h) and therefore best time and pace. I was so so happy! I didn’t even care if the berries kicked me out of ketosis, I need to be in best shape at Narva Energy Run on Saturday. Besides that I had to go to the grocery store so I cycled to the nearest town, all together 30 minutes. Tere! Minu nimi on Margit, olen 26-aastane Tartu spordifanatt, kes naudib reisimist, head sööki ja fotograafiat. 2013. aastal kaotasin oma kehakaalust ligikaudu veerandi ning tänu sellele leidsin uue ja tugeva armastuse spordi ning eelkõige jooksmise vastu. Praeguseks olen läbinud üle 70 spordiürituse, sh 4 täispikka jooksumaratoni, 17 poolmaratoni, 3 triatloni jpm. Selles blogis räägin enamasti jooksmisest ja treeningutest, aga jagan ka mõtteid toidu-, kodu loomise ja muudel teemadel. Minu blogi on 2016. ja 2017 aastal tunnustatud Eesti parima spordiblogi tiitliga.